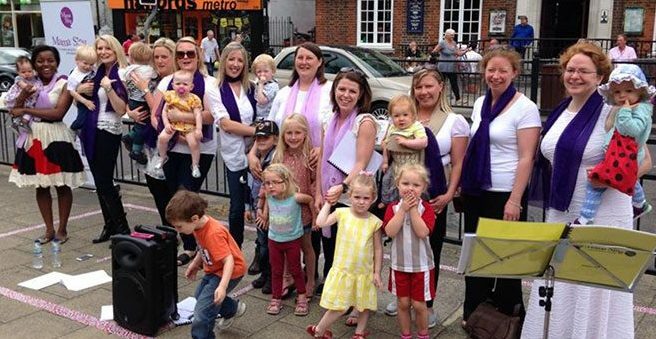 MamaSing is a choir for parents and babies. 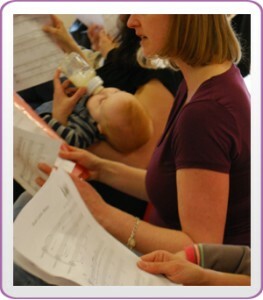 Once a week mums, dads, bumps, babies (and grandparents and anyone else who wants to join us) come together to enjoy singing. You don’t need to have any musical experience, or be able to read music (although you will probably start to pick this up along the way). There are no auditions, you just need to be enthusiastic and want to sing with us. If you enjoy singing, and want a friendly group that you and your little one can share then please come along, we’d love you to meet you. Did you know we frequently hear things like ”I’ve never done anything like this before” and “I can’t sing for toffee, can I still join?”. If that sounds familiar then this is the choir for you. We have no auditions and are completely inclusive.